Amaryllis tattoo was built on a foundation of passion and professionalism. We stand out as a uniquely service oriented studio with intricate ties to the community it serves. Our artists have over 25 plus years combined experience. They have the expertise to accommodate the connoisseur collector and the patience and understanding to walk a first time client through the process with comfort from start to finish. We take pride in providing especially high standards of sterilization. Sterilization records, PA Health Department vaccinations list and annual class certifications are always available to view upon request. We are extensively experienced in cover ups and all styles of design. Chris began at an early age drawing music related art, album covers and comics. 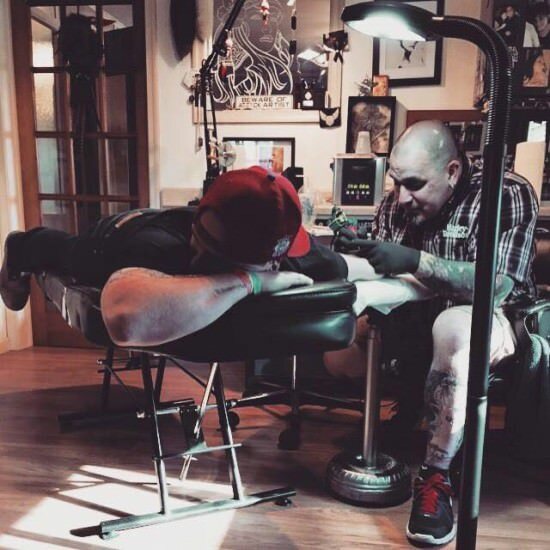 It was inevitable that his love for art and his love for tattoos would collide. He learned to tattoo at a local studio where he spent the next 10 years building his clientele and honing his skills. It was there that he discovered his affinity for creating cover up pieces. He learned that he enjoyed the puzzle aspect of working with cover ups. Over the next several years more and more clients were referred to him specifically for his cover up services. Now tattooing for 14 years Chris is considered a dedicated professional and a great many pieces he takes on today are cover up projects. Known for his ability to make the tattoo experience an enjoyable one Chris will turn your idea into something you love. Karin spent over 20 years in banking before “retiring” from the financial industry to open Amaryllis with her husband Chris. Writing and facilitating to large groups the best business and service practices became an unexpected passion and ultimately lead to becoming a VP. Karin’s final passion in banking became corporate involvement in charity causes both local and national. These days you will find her splitting time between the studio and the community where she works at their commitment to leave an exceptionally charitable legacy for their children and their community. She also operates her own business consulting services and is President of the board of BIP, Palmer Township’s Business Association. The face of all of Amaryllis’s social media accounts, if you have sent a message, commented or emailed via any of these you have no doubt spoken directly to Karin. Jason, or “Jay”, has been tattooing for 9 years. Before the life of tattoo, Jason grew up at the Belmar shore in New Jersey and worked in special effects makeup for Xanodria Productions Inc. He ultimately worked for 8 years at local tattoo studios learning everything he could and becoming an amazing tattooist. Jason landed on the Amaryllis doorstep in March of 2016 and we couldn’t be happier to have an artist of his caliber. Jay is great with clients and makes everyone feel comfortable and important. Jay considers his style illustrative and enjoys that style most. Got an elaborate idea in mind? Jay will make it reality. Though he will never scoff at the smaller pieces either. To him all pieces are special. It was very important to us to open in Palmer Township. We grew up in Palmer, still live and raise our own family in Palmer and were very excited at the prospect of bringing our business to Palmer. The township had never had a tattoo studio open before so we knew we would most likely have to clarify our intentions. We were confident that once they had a chance to hear what we were planning and how committed to the township and surrounding community we were that they would give us a go. Through the process of a zoning hearing we were granted the permission to open in the township and couldn’t have been happier. People took a chance on us based on our promises and we believe we have kept those promises. We continually strive to support community, charity projects, our veterans and township specific organizations. We want those that took that chance on us to always be proud and know that their nods of approval changed our lives forever.